The weather has been amazing this weekend, but I know that winter is just around the corner. 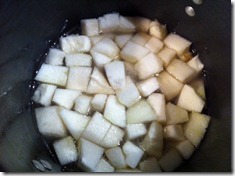 It therefore seems very apt to start cooking some winter melon. If you’ve never heard of winter melon, then you might know it instead as white gourd (note: fuzzy melon is not the same thing although it can look similar). Still doesn’t sound familiar? Well, it’s a vegetable that can grow as large as a pumpkin but has green colored skin with a white coating, and although it’s called a “melon,” it’s not sweet, and people generally eat it cooked rather than raw. 2lbs of pork spare ribs chopped up into 2-inch long small ribs (I ask the butcher to cube it for me – it’s much easier and quicker that way). If you don’t have or like pork spare ribs, you can substitute beef ribs or other red meats, but preferably always with bone in the meat. You can buy pork spare ribs in most large Asian supermarkets (or I got it at my local butcher’s shop in New York, Esposito’s Pork Shop, on the corner of 38th and 9th Ave). 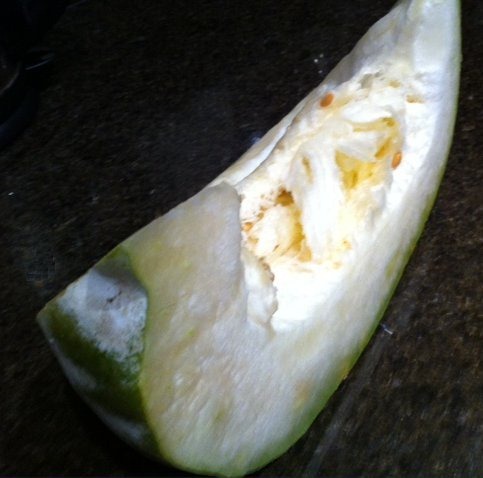 2-3lbs winter melon chopped into 1 inch cubes (you can usually buy just a slice of winter melon like the slice pictured above) – I bought this in Chinatown. 1 tablespoon of coarsely chopped fresh ginger. 3 tablespoons of chopped spring onions. 1 teaspoon of Sichuan peppercorns (easy to get in Asian supermarkets or online). 3 star anise (easy to get in Asian supermarkets or online). a spice or tea infuser (a small metal mesh container that allows the spice flavors to disperse into the soup without the spice itself being left in the dish – it’s a hassle picking out the peppercorns and star anise in soup, so I like to put them all into the infuser and just submerge the infuser in the soup). 1/4 cup of coarsely chopped cilantro (to add at the end). Place the 2lbs of pork ribs into a large pot and add cold water until it covers the ribs. Cook the ribs until the water boils, then pour out the water. This just rinses any blood from the meat. After pouring out the first load of water, add around 8 cups of fresh cold water into the pot (if you want more soup then add more water). Make sure there’s enough water to cover the ribs and that there’s space in the water for the winter melon too! Add the 2 tablespoons of salt, the 3 tablespoons of chopped spring onions, and the 1 tablespoon of coarsely chopped fresh ginger to the pot. Place the Sichuan peppercorns and star anise into the infuser and drop the infuser into your pot. Cook for an hour on a medium heat with the lid on if you have a lid to the pot (the water should be just boiling/bubbling a little). 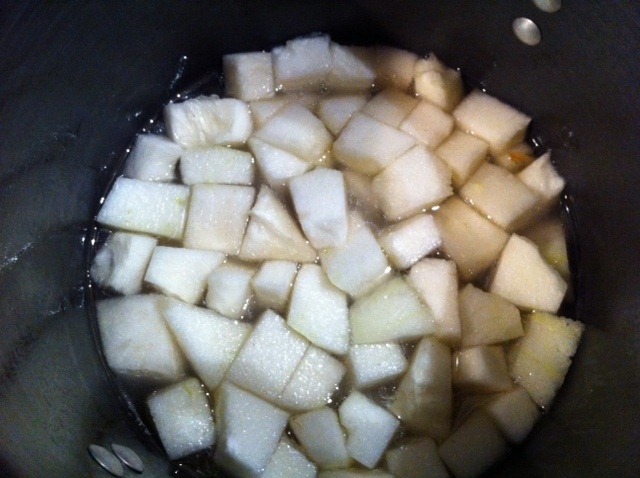 Add the chopped winter melon into the pot and cook for another 45 minutes with the lid on or until the melon looks translucent and is soft and easy to cut with a fork. 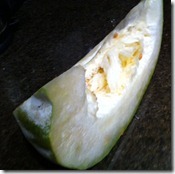 Ready to serve – put 2 or 3 pieces of ribs into a bowl with some of the broth and 6 or 7 pieces of the melon. I was planning to take a nice photo of the soup all pretty in the bowl, but it was so good that I completely forgot about the photo (this happens a lot actually!). Oh well, I will put up a photo next time I make the soup!